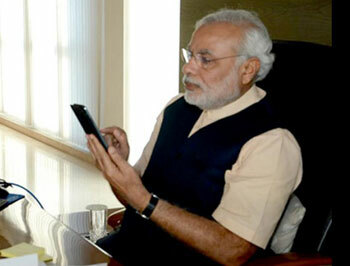 Prime Minister Narendra Modi today wished all the ministers and legislators of Tripura in the tele-conference and advised them to work for the development of the state.Prime Minister spoke over half an hour at 1110 hrs at a time in the individual mobile phones.BJP MLA Sushanta Choudhury said Prime Minister reiterated the schemes and programs of the Central government existing for the different sections of the society for different purposes. The tele-conference has showered blessings of Prime Minister on each one of them for successfully running the government in Tripura over a month. "We have been informed earlier that Prime Minister might call us on mobile and we were prepared for it. When call connects he started with praising the performance of the government and legislators of the state," Choudhury said.He pointed out that before getting nomination they were trained on nationalism and serving the nation selflessly. After getting elected Chief Minister in several occasions has given us advices and suggestions including to hold regular public interaction (Jandarbar) at least twice in a week in the respective constituencies, Choudhury stated. "We have been learnt about the schemes and programs from the chief minister and he gives us direction to keep a regular track on the implementation of the central schemes at the ground and listen to the people. We are also targeted to interact with each and every citizen of the constituency and send regular feed to Chief Minister for better governance," Choudhury stated. "Today's call from the Prime Minister is assumed special significance to us, as it shows the sincerity of the Central government not only about the elected representatives of the party, also about the commitment of prime minister to the people of Tripura," said Deputy Chief Minister Jishnu Dev Varma.